Oil fields abandoned by Burma’s state-owned oil company in Magway Division have turned into a lawless arena for local drillers and smugglers looking for a profit—with knife fights settling scores between rival drillers, company officials and local residents say. The Dahatpin oil fields, on a highway about 20 miles outside Minhla Township, was once controlled by the Myanmar Oil and Gas Enterprise (MOGE) in a joint venture, but has recently become a magnet for illegal drillers and crude oil sellers. “There were two oil fields under our supervision, but now the joint venture is gone and we’re not working there anymore. 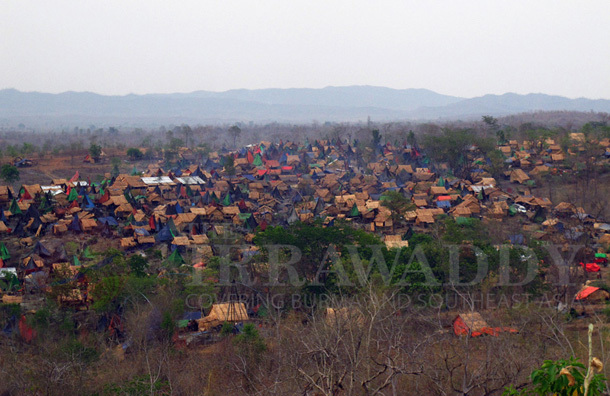 It’s being explored illegally,” the company’s deputy engineer in the Minhla Township told The Irrawaddy. Thawzin, an oil driller from Htankai village, said people from many different regions were trying their luck at the two fields, which are 25 miles wide. “There are more than 40,000 small oil wells here, and the oil field workers are from various regions,” he said. A sign at the gate of the oil fields warns of punishment for illegal drillers, but it seems no deterrent. The fields have become a popular market for not only crude, but also illegal drugs, alcohol and prostitutes, locals say. And when tensions arise, they knife fights are common, with three fights occurring recently. “Sometimes there are problems, but if you just work your job and don’t get involved in other people’s affairs, it’s OK,” Thawzin said. Min Latt, a driller who goes to Magway from neighboring Mandalay Division, said some wells produced 25 barrels a day. The crude is transported for sale either by waterway or by highway to the town of Monywa, which has about 10 refineries. On the drive, traders pass directly in front of the MOGE office. “We don’t have any right to arrest the drivers who transport the crude oil in front of our office. We see them every day, but that’s the job of law enforcement,” a MOGE official told The Irrawaddy, speaking on condition of anonymity. The oil fields in Htankai village came into MOGE’s control in the 1990s, during the former military regime. The old oil fields were explored by locals before 1996, but were then seized by MOGE in a joint venture with a private firm. Last month, about two years after reformist President Thein Sein assumed office, local residents took legal action and MOGE returned the land to them. As part of the deal, MOGE ordered the landowners to block the oil wells and forbid local oil drillers from working in the area. Although some landowners, mostly farmers, tried to follow these orders, their attempts to block the wells were stopped by prospective oil drillers and crude traders. As a result, farmers say they have been unable to grow their crops. Drillers say they pay the landowners anywhere from 100,000 kyats to 1.5 million kyats (US $105 to $1,600) for rights to a small oil well, depending on the oil yield, but some farmers say they receive no compensation. Others in the area do profit, however. Drillers and traders say they pay monthly bribes to local government officials, often of about 500,000 kyats. Car owners must also give drivers about the same amount of money to bribe officials along the way to Monywa. Thirty-two miles from Minhla Township, MOGE is allowing a private company to explore another oil field. Local drillers who want to work at the Ya Naung-Mone oil field make a deal with the landowners, and the oil company buys the crude for nearly market value. One oil trader said other oil fields in the region should learn from the Ya Naung field, where the drilling and trade occur legally and the state benefits from paid tax. At other fields, drillers continue to give bribes and lack legal rights. There are many potential oil reservoirs around the township.